Jimmy Barkan ...The Standing Bow Whisperer. 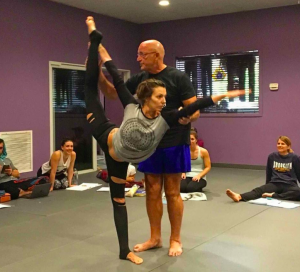 Jimmy Barkan …The Standing Bow Whisperer. This pose is 40% back bending, 40% standing leg stretching and 20% shoulder and hip joint release. 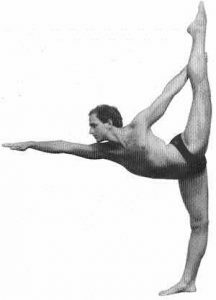 The key to the standing bow pose according to Jimmy Barkan is knowing how high to kick initially. If your standing leg is not very flexible, you can not kick too high because of the tension in the standing leg hamstrings. So kick back just enough to lower down to where your stomach is parallel to the floor. The more flexibility the standing leg, the higher you kick initially. You just have to feel it out like a musician playing an instrument! • At the advanced level, the opposite applies, you must start by kicking high in order to release the back hip. Use the first set to focus on balance and alignment and use the second set to find your full expression! Super-Advanced….When you are very close to straightening your upper leg but can’t quite get there, practice next to a side mirror. Then keeping your balance, (that’s the hard part), look at the your pose in the side mirror. Psychologically you’ll be closer than you think and that visual reference may be all you need to find that last inch and straighten that upper leg! !